Decisions can be hard to make. For some people decision making comes easier than it does for others. Most of the time I can make a decision… I am not saying I always make good decisions, just that I generally can make a decision. There are even times when I made some good decisions; however, I have made more than my share of bad and/or dumb decisions. One my most memorable dumb decisions occurred years ago when I was a young man selecting a Mothers Day gift fort my wife. My intent was to buy her that “special gift” that would really wow her. This all happened during a time in my career when I traveled often. Some weeks I would leave on Sunday evening and return on Friday. My wife is a real sweetheart and team player, so much so she would mow our lawn in the hot Texas heat so I would not have to do it on the weekends. Yes… you read it right she mowed the lawn! Each week she would mow the yard and each week she would struggle with our old worn out lawnmower to get it started. She would tell me about how she pulled and pulled on the rope to get the engine started. For several days I had been trying to decide what to buy my wonderful wife for Mothers Day and I was flat out of ideas… until I drove by a True Value Hardware store and saw a brand new “easy pull start” lawnmower. In a flash it struck me this would make the perfect Mothers Day Gift for my wife. Okay.. I probably don’t have to go into all the details, believe it or not I bought the lawnmower and found out it was not the perfect gift I thought it would be. The lawnmower seemed like such a good gift idea, at least from my perspective. And that was the problem with that dumb decision, it was based only on my perspective. I failed to understand what my wife really wanted for Mothers Day and it was not the “easy pull start” lawnmower. 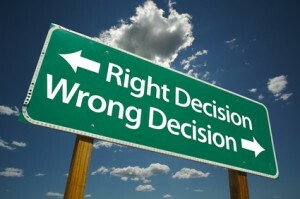 If you have ever made decisions then you have most likely made your share of bad and/or dumb decisions. Hopefully you did not buy your wife a lawnmower, but you may have made similar dumb decisions. Here the point of this whole story. You are going to make bad decisions! 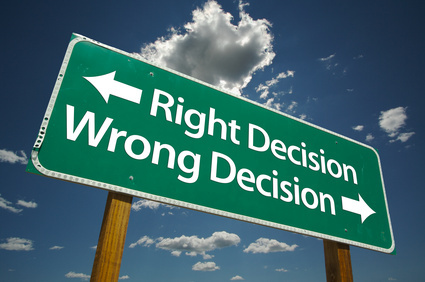 Avoiding making decisions due to fear of making the wrong decision is the worst thing you can do. Leaders Must Make Decisions: By not making a timely decision you do not make things better, often things become worse when ignored. Customers are lost, critical windows of opportunity are missed and even businesses fail because a leader failed to make a decision at a critical time. Leaders must make decisions with the best information they have available to them. Many critical decisions can not be put off for weeks, months or years until you have enough data to make you feel 100% certain. Usually when I feel 100% certain… that is when I have made my worst decisions i.e. the lawnmower gift. Leaders Will Make Bad Decisions: When I bought the lawnmower I made a bad decision. When I realized I had made a dumb choice of gifts for my wife, I was embarrassed and felt foolish. However; I did not stop buying her Mother Day gifts, I learned from my bad decision that she did not want lawn equipment for a gift (go figure). One thing that is certain, we will all make bad decisions and when it happens we feel embarrassed and foolish. What is important is that we realize we made a bad decision, take ownership and learn from it. Leaders Will Make Good Decisions: On the positive side leaders can make more good decisions if they simply do not look at the things from their point of view only. The ratio of good decisions to bad decisions will greatly improve if you seek input from others and seek to understand the decision from the view point of others. Once I understood my wife (all wives) did not want lawn equipment, power tools or cool kitchen gadgets I began to make better decisions that were usually came from the jewelry store instead of a hardware store. Now that I shared one of my dumbest decisions. Share with the other readers one of your dumb decisions and what you learned. Just post it in the comments section. If you like this blog read more from Steven D Wood in his new book.